But exposure in the OR isn’t the only problem. Anesthetic gases may also be contributing to global warming. Anesthetic agents used today are volatile halogenated ethers – which are known to be greenhouse gases. 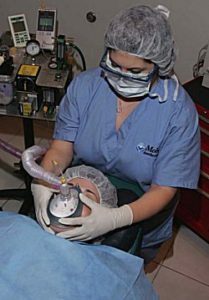 The patient metabolizes less than 5 percent of the anesthetic and the rest is routinely vented outside the hospital and released into the atmosphere. The amount of green house gases discharged by 2000 250mL bottles of volatile halogenated ether anesthetics is equivalent of driving 250 cars for a year. This article from the CDC describes the health effects that may occur to healthcare workers from exposures to waste anesthetic gases and ways to decrease exposures. In this blog post, NPR describes research released in December 2010 that quantifies the effects of waste anesthetic gases on global warming.